Welcome to FGPC’s first race of the year! Thank you for your participation! See you next year. 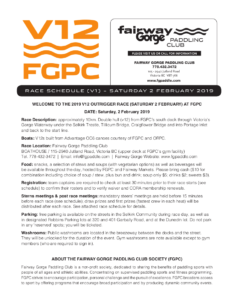 Race Description: Double hull (v12) from FGPC’s south dock through Victoria’s Gorge Waterway under the Selkirk Trestle, Tillicum Bridge, Craigflower Bridge and into Portage Inlet and back to the start line, a 9.75km race. 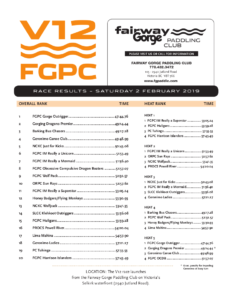 It’s a fun middle distance race that’s available to everyone, held on Saturday February 2, 2019 . There are prizes to be won, food to be eaten, and victories to be defended. Race start is at 9 am. Registration opens at 8 am, 8:45 am steers meeting. Teams will be registered on a first come, first served basis. Deadline for registration is January 23, 2019; if registration fills before the deadline your crew will be waitlisted. Fee is $180 ($15 per paddler). Please note: Individual Digital Waivers required for each paddler, along with CORA 2019 paddler memberships. In addition to completing this registration agreement, the Team Captain/Manager must ensure that all paddlers complete an online individual FGPC waiver and update their CORA memberships. Please note: Any crew that does not provide a complete, waivered roster (last minute changes excluded) by January 25 will be charged an additional 20% admin fee ($36 incl GST), payable on race day, to compete in this event. There will be 25% administrative fee for all withdrawals. The final date to withdraw a team from the event is January 23, 2019. There will be no refunds of any type after this date, including if the event is cancelled due to safety reasons. If you have any questions or concerns about this registration process, we’ll be happy to walk you through it — send us an email at race@fgpaddle.com and we’ll get in touch with you!